Yesterday I posted a picture of a Dutch Tool Chest I’m making. It’s just a busywork project, something to do for fun. It was decidedly less fun when I discovered that I’d done the joinery for one end bass-ackwards. Not really the end of the world, this is the cheap common pine. It’s also slightly cupped, even after flattening it, it cupped again. And it’s not like I need a tool chest. Having said that, I’ll probably end up building two or three of these. So, I cut one set of pins off, and re-cut them. No biggie. The sawing went much better, it helped that I put up more shop lights in the intervening time. I plan to make one of these soon (though for me it will be a bit more than busywork). How was it using the Moxon? The Moxon vise is great! It holds the boards absolutely solidly, My only problem is that I don’t have anywhere to put the Moxon when I’m not using it. I’ll need to make a shelf on the wall or something. 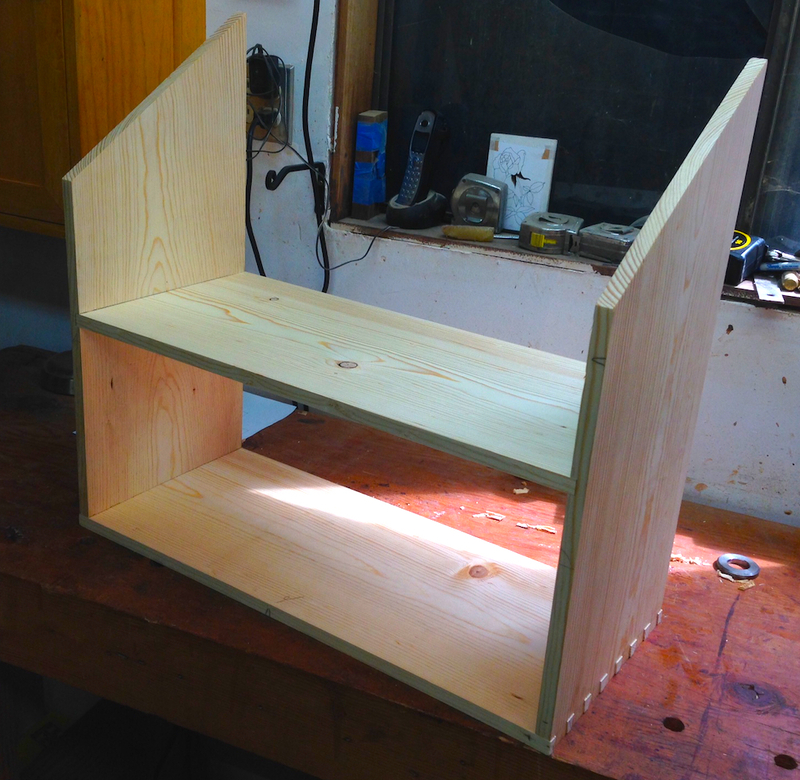 Have you seen Paul-Marcel’s (Half Inch Shy) solution to the storage problem? A French cleat. His configuration is different than yours, so his solution might not be adaptable. It’s just Home Depot 1″ X 12″ common. I’ve been trying to get “select” pine there, but the local stores never seem to have it in stock. The “common” is not nearly as dense as I’d like. A lot less artistic, but much more functional. The “select”/clear pine here is radiata. Pretty decent to work with. All other is labeled as “whitewood”. Hateful spongy stuff. Really great if you happen to like knots.